Sixty-five percent of the U.S. population carries extra weight; over 30% are considered obese. The list of medical maladies associated with obesity is long, and obese people have a shorter life expectancy than lean individuals. This lecture will discuss how research is unraveling the complex networks controlling eating behavior and body weight regulation. MONICA C. SKARULIS is a physician and senior clinical investigator with special training in endocrinology, diabetes and metabolism. She is the director of the Metabolic Core Unit and chief of the Clinical Endocrine Section of the National Institute of Diabetes, Digestive and Kidney Diseases. She and her colleagues are examining the physiological, hormonal and behavioral traits that lead to obesity, weight loss or relapse. Additionally, she and colleagues conduct research into thyroid function and its effect on metabolism, the neuroendocrinology of sleep and its impact on metabolism and novel treatments of adolescent diabetes resulting from obesity. As the director of the NIH Inter-Institute Training Program in Endocrinology, Diabetes and Metabolism, she and her colleagues have trained over 120 physician-scientists in the subspecialty of endocrine, diabetes and metabolism in the last eight years. Many graduates conduct independent clinical investigation across the United States and abroad. Her leadership extends beyond the NIH campus. 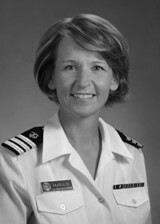 She is a Commissioned Officer in the U.S. Public Health Service and has participated in past disaster relief efforts. She has received three commendations from the U.S. Public Health Service. She has been honored with the NIH Director’s Award of Merit and has been recognized for her teaching by NIH fellows and the Uniformed Services University of the Health Sciences. She earned her medical degree from New York Medical College. She completed an internship and residency in internal medicine at Cornell University Medical College and an endocrine fellowship at NIH. President Ruth McDiarmid called the 2,219th meeting to order at 8:17 pm March 16, 2007 in the Powell Auditorium of the Cosmos Club. The recording secretary read the minutes of the 2,218th meeting and they were approved. Ms. McDiarmid made announcements. She encouraged people to suggest speakers and to bring friends to meetings. She reminded us that contributions are tax exempt. She made the parking announcement. Ms. McDiarmid then introduced the speaker of the evening, Ms. Monica Skarulis of the National Institute of Diabetes, Digestive and Kidney Diseases of the National Institutes of Health. Ms. Skarulis spoke on The Role of the Gut, Hormones and the Brain in Obesity. Ms. Skarulis set out to explain the scope of overweight and obesity, insights into the complex networks of the brain, gut, and hormones that control weight, and the NIH Intramural Obesity Research Program. Weight is a function of eating and burning calories. People who eat more than they burn gain, people who eat less than they burn lose. Exercise affects how much energy people burn. A pound of body weight equates to about 3500 kilocalories (kcals). Energy used in keeping the body functioning is called the basal metabolic rate. Energy above that rate is burned by exercise. Even fidgeting counts. She referred to excess energy stored as fat as an “energy crisis.” The average U.S. adult gains 1.5 lbs a year, attributable to consuming an extra 25 calories a day, about 1/6 of a Coke. The common denominator is the body mass index. This is simply a person’s weight in kilograms divided by the square of the height in meters. Normal body mass by this formula is in the range of 18.5 – 24. Above 24 is overweight. Thirty or above is obese. Forty or above is “class 3” obese. Although all epidemiologists use it, the formula does not work for everybody. NFL linemen are all overweight or obese by the BMI although they have little fat because their muscle mass is off the scale. However, for most people, the index is a good indicator. Ms. Skarulis showed a graph that indicated that, for the past 30 years, the number of overweight people in the U.S. is remaining fairly constant. The problem is that the number of obese people is increasing and the number of normal people is decreasing. The health consequences of obesity are cancer, diabetes, coronary heart disease, high blood cholesterol, high blood pressure, sleep apnea, gallbladder disease, osteoarthritis, and depression. Although overweight has often been seen as a failure of will, 70 to 80% of weight determination is genetic. Single gene determination of weight is rare, multi-gene weight determination is common. Also common are gene-environment interactions. The hypothalamus regulates feeding, thirst, temperature, and sexual behavior. Within the hypothalamus, the satiety center gets nervous inputs from stretch receptors and chemosensors as well as hormone inputs. Leptin comes from the adipose tissue, insulin from the pancreas, and ghrelin from the stomach. It is thought also to be influenced by “hedonic inputs” from various sensory systems. Leptin is a hormone derived directly from fat. Mice with a genetic mutation that causes miscoding of the hormone are fat and eat opportunistically. She showed a mouse on a scale outweighing two cohorts. When treated with recombinant leptin, the heavy mouse reverted to normal weight. They have found the same effect with a child with the same disorder. A single injection of leptin changed the child’s eating behavior completely. A related disorder, lipodystrophy, was found in a girl and therefore produced no leptin. This girl had no subcutaneous or intrabdominal fat. Her fat was being stored in bumps in her skin, called eruptive xanthomas, and in her liver. Leptin replacement reduced her appetite and her liver returned to normal size. Also, she had not started puberty, and the leptin returned that process to normal. Leptin deficient people are also infertile. Leptin deficiencies are quite rare. They improve our understanding of weight control, but absence of leptin is not the problem of many people. However, it may be that inability of leptin to reach the brain is a cause of obesity. In normal people, leptin decreases as fat decreases. Lower leptin levels result in decreased energy use and increased appetite. Ghrelin is a gut hormone involved in satiety. Ghrelin is sensed in the gut by sensors of the vagus nerve which connects to the satiety center. Ghrelin increases during fasting and decreases during eating. During weight loss, ghrelin levels get higher. Glucagon like peptide 1 (GLP1) is secreted in the small intestine. It slows gastric emptying, induces satiety, and inhibits glucagons. It is sensitive to insulin. The vagus nerve also has receptors in the lower intestine that transmit GLP1 level to the satiety center. Ms. Skarulis described the NIH Intramural Obesity Research Initiative, of which she is part. This is a wide ranging attempt to better understand weight control. They are attempting to determine obesity phenotypes, effects of sleep on weight and metabolism, and the weight loss – inflammation connection. The effort involves sleep research, for which they have 10 beds. They also have an eating behavior lab, an exercise testing lab, body composition measuring equipment, and respiratory suites, where people’s exhalations are analyzed. The fundamental behaviors of interest are eating, sleeping, and physical activity. They want to understand how these behaviors can be brought under voluntary control. They hypothesize that conscious decisions are influenced by the genetically determined networks that regulate body weight. In attempting to define the phenome of weight, they study hormones and metabolism, body composition, energy expenditure, sleep, physical activity level and fitness, eating behavior and taste sensations, neurocognitive function, psychological state, and functional status and quality of life. They have found that there are many supertasters, people with sensitive tongues, among the chefs of the world, and that nontasters tend to have higher body weight. Among children who have many ear infections there is a higher frequency of nontasters. People who sleep less tend to weigh less. They are also considering the possibility that overeating is an addiction. A 2005 study by Volkow and Wise in Nature Neuroscience indicated impaired prefrontal cortex function in obese subjects, similar to cocaine addicts. Ms. Skarulis offered to answer questions. In response to questions, she said athletes do seem to gain weight faster when their activity level goes down. She also observed that brain tumors can affect weight. One questioner volunteered that she is supposed to take Byetta, a drug derived from the poisonous spit of gila monsters, but it makes her drowsy. Ms. Skarulis said she would not have predicted that. Byetta causes gastric emptying and reduces blood sugar. Another questioner asked, given the significance of leptin, wouldn’t it be logical to try leptin shots for weight loss? Yes, Ms. Skarula agreed, and there is a company doing tests. One can lose five to six kilos with it; it is not a cure-all. There was discussion of chemicals in the environment. Ms. Skarulis agreed they might be problematic. A chemical commonly used to line poptop cans has been found to affect the thyroid of cats. Resveratrol, a substance in grape skins, is beneficial but one would have to drink a thousand bottles of wine to get enough. We can never say, drink more for good health, she said. Someone said it appears that what has happened is social. Ms. Skarulis agreed. Ms. McDiarmid thanked our speaker and suggested people ask any other questions over a glass of something. She presented a plaque commemorating the occasion. Finally, at 9:37 pm, she adjourned the 2,219th meeting to the social hour.